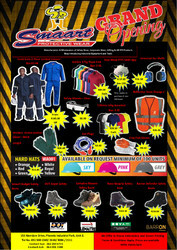 Smaart Protective Wear has just opened another branch and have these amazing specials. All your needs under one roof from construction equipment, industrial supplies, stationery, safety wear, PPE, corporate wear, cleaning and hygiene consumables. We also do inhouse embroidery and screen printing. Very reasonable and competitive prices. We will beat any written quote. Efficient service and delivery. Contact Sue on 062 283 6715 or Ash on 064 091 3388.